Scalini is a vibrant establishment with a contemporary edge. 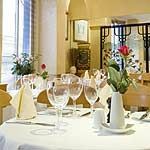 Here you can dine on a divine menu of Italian cuisine cooked by highly trained chefs using the finest and freshest produce. Do you work at Scalini? What did you think of Scalini? An extremely lively restuarant with good service without it being over the top. The menu is varied and will suit all palates from starters to desserts. It has a good wine list which is competitive in value. Do not go there if you want a quiet tete-a-tete with the girlfriend as the place is buzzing espeically after about 7pm. Price wise, about £40 per head for a complete meal plus any drinks you may consume. I've been there plenty of times and have never had a bad experience, food wise, service wise or atmosphere wise. I've been to Scalini loads of times and will keep going back. It's a really nice place with a traditional Italian feel to it and some delicious food. If you want a nice meal out you could do a lot worse than Scalini. had a wonderful meal on a very busy sunday evening, the portions are huge, and you get lots of complementry olives, cheese and bread that fills you up even before you start. nice atmosphere, very quick service as so many staff milling around. the owner is always there to greet his customers, get the feeling its full of regulars ans few famous faces. suggest you book as gets so busy.very large menu choice and they will change anything to you choice. This restaurant provides good food and you get plenty of it not like Nouvelle Cuisine. I always leave there with a full stomach and pleasant memories of the man with a moustache singing Volare. The atmosphere is bubbly and you always leave with a smile on your face. The prices are about the same of any good restaurant but it is worth paying for. Once you have been you will go again and again. Night after night, decade after decade, Knightsbridge and South Kensington’s well-heeled denizens pack out this dining institution, but why, when the food and decor are dated, the tables cramped, the room seriously noisy, and the prices little short of stratospheric? Scalini is an attractive blue building set amongst dinky townhouses, select bars and one-off boutiques on the kind of street that whispers rather than shouts serious money. Two connecting dining rooms sport the fussy, peach-toned decor of an 80s housing estate show home. Regulars say nothing ever changes at Scalini (that’s partly why they love it), so the look may actually date from then! Tables are packed tightly and all are taken, even on weeknights. The diners are an international-looking bunch but all ooze cash. They all end up shouting a fair bit, too, thanks to truly appalling acoustics. Service is old-fashionedly chauvinistic, with questions about bookings and wine lists automatically directed to the man in the group, even if it’s a woman who makes the request. Can’t we expect restaurants to be gender-blind in the 21st-century? Other than that, service is fine, although a fair amount of waving is necessary to get the bill. Everyone seems to be having a lovely time despite the shortcomings. There’s no denying the buzz. Famous faces are routinely spotted. Crisply efficient waiters somehow manage to squeeze fairly unobtrustively between those crammed tables. Top quality mixed olives, not bad bread and watery, tasteless, chopped tomato to pile onto it are already in place as diners take their seats. Starters are divided into cold, hot and soup options, 26 in all. All the old favourites are there, like carpaccio of beef, ham with melon, baked avocado with crab, seafood salad and smoked salmon. Avocado Reale is sliced avocado with lobster, celery and cocktail sauce. The avocado is fine, the lobster a fairly generous portion of tasty, if slightly chewy, meat. The celery adds a welcome crunch and the cocktail sauce takes you straight back to the 70s. There’s nothing wrong with this dish if you like your food simple and retro, but why doesn’t the price of more than £16 cause at least one heart failure per service amongst the more corpulent patrons? Zuppa di Crostacei (shell fish soup) has a good depth of flavour and will set you back £10. There are 11 pasta and three risotto options (the latter for two persons only), eight fish mains and a staggering 25 meat choices. Again, classics abound, like beef medallions in Madeira and mushroom sauce, chicken breast stuffed with garlic butter, half a roast duck in orange sauce, and grilled Dover sole. A skate wing with black butter, capers and garlic (£18) is acceptable. The fish is cooked well but the sauce is a bit insipid, neither the capers nor garlic really registering. King prawns in a spicy garlic and butter brandy sauce (£21) is better: the generous row of prawns arrive still in their shells, so there’s dismantling to be done, but the meat is sweet and the sauce unctuous – old-fashioned in the best sense. The selection of vegetables, served with both dishes, is a sad affair, featuring slightly overdone French beans, bog-standard broccoli and roast potatoes that lack crunch. Of the pudding options (all £5.50), delivered verbally by the waiter, a selection of ice creams is pleasant but wouldn’t have an Italian weeping nostalgically. Cassata is a modest portion and the flavours in the different layers are tame. If the food prices haven’t already made you giddy, the cost of wine may. The house wine on the extensive list starts at about £15, rising to nearly £700. A French Sancerre arrives correctly chilled and is very pleasant. Waters, soft drinks and all the other options you’d expect are available. If this food were half the price and served at a high street trattoria, it wouldn’t be a bad deal for nostalgia lovers: even the noise level and sardine-style seating might be acceptable. But how a restaurant charging top dollar in one of the capital’s most exclusive enclaves gets away with it, year after year, may baffle the uninitiated. Maybe Scalini is like a close relative: you’ve known them for a very long time and have had some good nights with them, so you love them unconditionally and are blind to – or, at least, highly tolerant of – their shortcomings.